When we were planning the previous "celebrity inspired", we saw these other looks from Nina&Ian and we saved them because we weren't sure which one we wanted to do first. We were supposed to wait more time to post them so we wouldn't be so monotonous... but.. whatever! As you can see, we made a couple of changes to the look (like her shoes are snakeskin and her bag is brown and mine are the other way around)... but the inspiration is pretty obvious! My whole look costs less than her Mulberry bag (and that's even counting my bag, which is a little less affordable than the rest of my purses). Once again, I thank Gabo for joining me in this fun post... even though, he is definitely starting to like it- it was his idea today! It was a very casual day, we had lunch and head to exchange something for my styling photoshoot (which is finally this Saturday)- can't wait to take the pics and show them to you. I hope you like these looks for less! Happy FRIDAY! 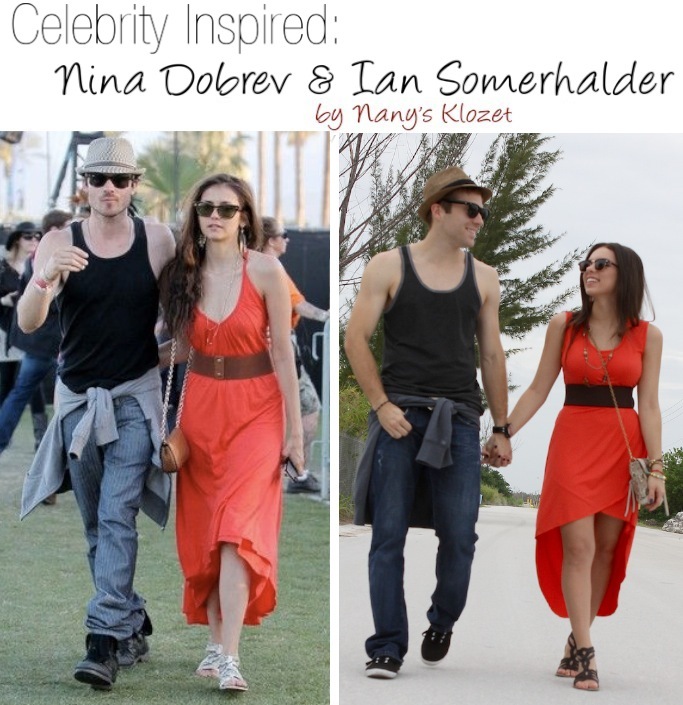 Planeando el "Look por menos" de Nina e Ian la semana pasada, también guardamos este look que usaron en Coachella y estábamos indecisos de cual hacer- se supone que íbamos a esperar más entre uno y otro para no ser tan monótonos por aquí... pero que importa! Como pueden ver, el look no es totalmente idéntico pero las piezas son extremadamente similares y cuestan mucho menos. Mientras que Nina utilizó unas sandalias de estampado de culebra y una carterita pequeña marrón, yo invertí la combinación. También considero que el largo de mi vestido favorece más a las figuras petite. Una vez más... gracias a Gabo por acompañarme (aunque le está agarrando el gustito por hoy fue él el que quiso hacer el look). Hoy fuimos a comer y después rápido a cambiar unos zapatos para la sesión de fotos, que finalmente es el sábado. Espero que les gusten los looks por menos y que les haya gustado este! FELIZ DIA! omg! so cute are super cute! picture perfect! and i must add high low is so in! on point! Love those glasses with the orange. Stunning!! Wow! I almost thought it was the same pic side by side. Good job with recreating the outfit. Me encantó! Qué lindos se ven, y el look por menos está increíble :) Saludos Dany! You guys are adorableee! My boyfriend and I are thinking of trying it out. Thanks for the inspiration chica! Sinceramente te ves más linda que Nina! un abrazo desde México wapa! Nice look-a-like celebrity inspired. You guys look adorable! What a fun idea, you guys look fantastic! And it's always nice to see celebrity couples be normal people- keep it up!! A mi. Me gusta mas tu vestido!! Estáis muy guapos los dos!! Oh wow, you two look so much better! I love it. This dress is so cute.!!! oh and I love your new header, it's gorgeous! Como os pareceis!!!!! Me encanta la combinacion del vestido asimetrico, cinturon y sandalias. Love this! You are so great at putting together 'looks for less'. Pues mira, mirando las fotos honestamente me gusta mas ustedes! Los dos se ven muy bien!!! So cute! You all look amazing! :) Loving the color of your dress! Tan bello tu Gabo ya lo contagiaste ;-) se ven divinos ustedes y lucen mas naturales y expontaneos con el look que Nina e Ian..
great outfit inspiration! so cute love how you guys pulled off the look! I love when you do these! you guys look great! SIIII Definitivamente te ves mucho mejor tu!! Bueno ustedes!! SO cute! I love the red on you! 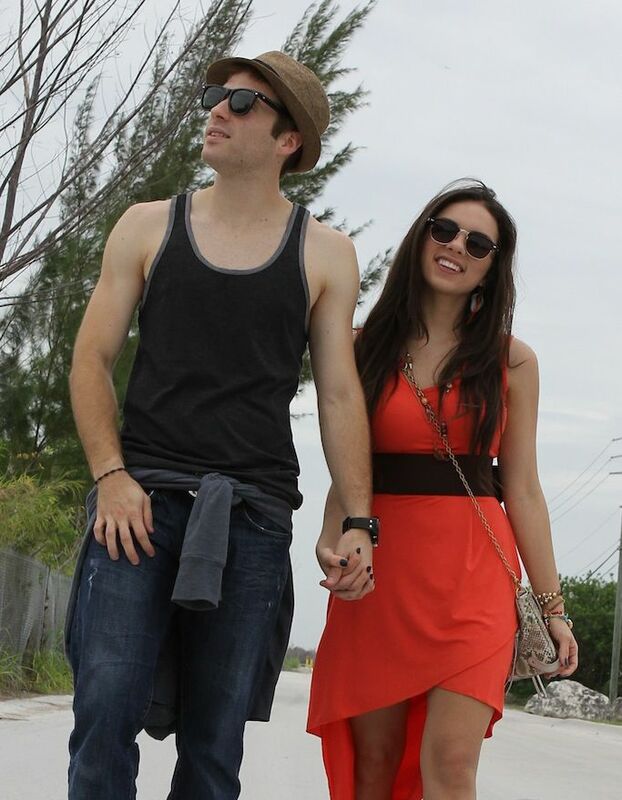 Super cute and I think it's great you two can share your love for fashion. Awesome way to build memories & spend time together.